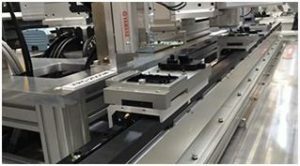 The linear conveyor module, LCM-X is the latest magnetic mono- rail system from Yamaha that offers even more accuracy and flexibility than anything else like it on the market. The issues facing the manufacturing industry continue to increase each year: shortened lead time, reduced cost, increased product quality, support for small production lots of diverse types, and reduced installation space. At a single stroke, the LCM-X solves these issues by fundamentally overturning existing concepts of transport between manufacturing processes. Why not implement the next generation of production line with us?